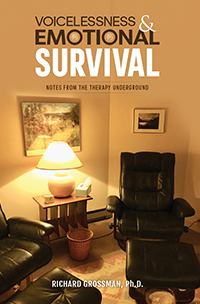 Voicelessness and Emotional Survival: Notes from the Therapy Underground (2018) by Richard Grossman, Ph.D.
“Sadly, it is the rare person who can enter another person’s world at the deepest and most vulnerable level. One of the main reasons I chose to become a therapist was to learn how to do just this. Naturally, I had expected that, as a result of their training, therapists would be far better than most at entering other people’s worlds, overcoming whatever obstacles and barriers they found in the way. But, over and over again my psychology teachers, supervisors and personal therapists taught me that they were no better than others at entering another person’s world, even though they believed they were experts. But another important question needs to be answered first: Is it critical that all therapists be able to “hear” and enter a patient’s world in this way? In fact, for many patients the answer is no. Many patients are satisfied with practical advice, learning ways of training their brain to respond to distress in a new and different manner, or receiving simple emotional support as they struggle with the omnipresent pain that life and living with other human beings brings. But as I have learned in my own life and by co-experiencing the lives of others, aloneness at the deepest level is often the most troublesome and hindering aspect of “being” in this world. And having another person with you—sometimes in person, but also held in the cognitive and emotional parts of memory—is one of the most important and healing parts of therapy. Because I learned this so early in my “training,” my career has been devoted to studying “voicelessness” and what can be done to help people who suffer as a result of it. Why can’t most therapists listen accurately and with empathy? And why do all therapists believe they can? This book addresses these questions. The follow-up questions are even more important: Can therapists be re-taught to enter another person’s world at the deepest and most vulnerable level? And, if they can’t, what are current and future patients to do with this dark reality?